$28.027 million on 2808 screens. Fresh off an Oscar win for 2010’s The King’s Speech, it probably would have made sense for director Tom Hooper to take on another historical drama. With work on efforts like The Damned United and John Adams as well as Speech, that seemed to be the genre he preferred. Given the raised profile that comes with Oscar success, Hooper likely had his pick of projects, and he chose another historical piece, but with a twist: a film adaptation of the stage musical Les Miserables. Darned if Hooper didn’t make it work. Not only did 2012’s Les Mis do quite well financially - $147 million box office in the US alone – but it also received good reviews and snagged an Oscar nomination for Best Picture. Argo won that prize, but Les Mis took home three awards – including Best Supporting Actress for Anne Hathaway – and allowed Hooper to avoid the slump that so often affects Oscar winners. Les Mis opens in France circa 1815 and introduces us to Jean Valjean (Hugh Jackman), a prisoner who serves out a 19-year sentence simply because he stole a loaf of bread. (Actually, five years were for the theft; the additional 14 occurred because of escape attempts.) Lawman Javert (Russell Crowe) grudgingly lets Valjean go on parole, but he warns the ex-con to obey guidelines or suffer the consequences. Though happy to be free, Valjean finds a harsh, unwelcoming world until he meets the Bishop of Digne (Colm Wilkinson). The Bishop gives Valjean food and shelter, but the ex-con immediately betrays his host and steals silver from the cathedral. When police capture Valjean, he claims he received the goods as a gift, and the Bishop maintains the lie to keep him free – though he instructs Valjean to change his ways. Which Valjean does after he slips the conditions of his parole to adopt a new identity. This doesn’t escape the notice of the ruthless Javert, who swears to find Valjean and bring him to justice. The film follows that thread as well as what happens when a prosperous Valjean agrees to care for Cosette (Isabelle Allen as a child, Amanda Seyfried as an adult), the daughter of doomed factory worker Fantine (Hathaway). Given that I wasn’t wild about King’s Speech and that I’m not a fan of musicals, I can’t say I greeted Les Mis with a lot of optimism. However, it managed to overcome those potential negatives to turn into a fairly involving and emotional experience. One aspect of Les Mis separates it from most movie musicals: the staging of its songs. For one, it includes no dancing. Rather than throw out the usual collection of song ‘n’ dance numbers, the tunes exist as purely dramatic enterprises and they lack the standard prancing. In addition, Les Mis includes almost no spoken dialogue. This doesn’t mean it offers wall-to-wall songs, however. While it probably comes with more tunes than most musicals, it still provides dialogue – it just asks its actors to sing the lines and not speak them. I feared that’d become an annoying contrivance, but the “sung speech” works fine for the movie. Actually, this technique allows the shift from dialogue to songs to occur more smoothly than in most musicals. Since we always hear singing – and we get none of the standard “stop everything for a long dance routine” – the package fits together in a fluid manner. In many musicals, the production numbers come out of nowhere and cause the story to grind to a halt, but that doesn’t happen in Les Mis. Though the film does provide a few scenes that almost turn into standard “musical showstopper” status. Probably the most obvious candidate comes with “Master of the House”, a sequence that seems to exist mainly as comic relief. Of all the movie’s segments, “Master” probably does the least to serve the overall narrative; while it does allow us to learn how awful Cosette’s caretakers are, it fails to advance the story in a notable way. Still, that comic relief serves a purpose. Les Mis threatens to overwhelm with its gloom and misery, so a short break helps keep the viewer from suicide. Besides, “Master” delivers black humor, so it doesn’t seem out of place; it’s not a jarring change of tone ala “A Guy Like You” in Disney’s Hunchback of Notre Dame. In any case, the movie does integrate its songs unusually well, and I appreciate the lack of true production numbers. 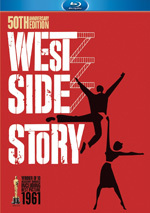 I’m sure I could find another musical without dancing if I thought hard, but off the top of my head, none come to mind. It’s a choice that works for the film, especially because it means we avoid super-long diversions that threaten to drag the narrative off-course. As far as that narrative goes, I think Les Mis remains most interesting in its first half. Granted, one could argue that the opening 70 minutes or so almost play as a prologue, and the second half – in which we meet an adult Cosette and see her relationship with suitor/revolutionary Marius (Eddie Redmayne) – provides the meat of the film. That portion also focuses on a student rebellion against French leadership, an affair in which Marius actively participates. This means that while the Valjean/Javert plot remains in place, it takes a backseat to things revolutionary and romantic. Unfortunately, that also means the film’s second half seems spottier than the first. Not that the final 80 minutes or so bore; they come with some good drama and action. But they just don’t live up to the opening half, and the reduced role played by Valjean/Javert takes its toll. No, I won’t argue that the movie should’ve played like a 19th century musical version of The Fugitive, but I still would’ve liked a stronger focus on the old adversaries. They bring the tale to life when they appear, and without them, it feels more ordinary. Maybe I just have little patience for trite tales of young love, and I think the Cosette/Marius relationship qualifies. Heck, Les Mis even throws in the requisite third wheel via Marius’s fellow revolutionary Eponine (Samantha Barks), a babe utterly devoted to him. You win nothing if you determine her fate in advance – and the rest of the Cosette/Marius theme doesn’t tend to go much of anywhere remarkable, either. Which is too bad, for much of the rest of the film works pretty well. Jackman provides an especially strong performance as Valjean; he handles the singing well and gives the role all the nuances it needs. Apparently many mocked Crowe’s vocals, but I take no offense at his gruff intonations; he meets the part’s dramatic requirements and carries a tune well enough to avoid embarrassment. As for Hathaway, she does fine as Fontine, though I’m not sure she deserved an Oscar; heck, I found her work in Dark Knight Rises to be more impressive. The Academy likes to reward actresses who ugly up themselves, so Hathaway’s willingness to lose weight and chop off her hair – on camera, no less! – certainly must have endeared herself to the voters. Don’t take as an indication I think Hathaway harms the part, though. She manages to accomplish what the brief role needs and gives the film some heart in its early moments. While I’m skeptical that she deserved the Oscar, she suits the movie pretty well. Young lovers Seyfried and Redmayne do less to impress and fail to elevate their parts above their roots as generic pretty people. On the other hand, Barks packs a lot of spirit and emotion into her short turn as Eponine; she creates easily the most indelible character found in the film’s second half. Hooper stages the film in a moderately effective manner. He got a lot of attention because he asked the actors to sing live on camera rather than lip-synch; I’m not sure this technique really benefits the film, but it may add a bit of immediacy that otherwise might be absent. Hooper can’t bring a lot of zing to the production, though. Granted, one could argue a tale as dark and dramatic as Les Mis shouldn’t get the razzle-dazzle treatment such as what Rob Marshall gave to Chicago, but I can’t help but wish Hooper would liberate the production from its semi-stagnant feel. He uses handheld camerawork in a generic manner and fails to find much life in his choices. The movie remains effective but I think it could’ve been staged in a more evocative manner. At least Hooper stays out of the way of the material and doesn’t shoot himself in the foot. While not the most vivid film musical I’ve seen, Les Miserables nonetheless manages to remain involving and emotional through much of its running time. It ends up as a quality production with some modest problems but no glaring flaws. Les Miserables appears in an aspect ratio of approximately 1.85:1 on this Blu-Ray Disc. No issues cropped up in this impressive transfer. Sharpness usually looked terrific. The only examples of softness resulted from occasional examples of dodgy focus; otherwise, the image was tight and well-defined. Jagged edges and moiré effects failed to appear, and edge haloes weren’t an issue. In addition, the movie suffered from no specks, marks or other source flaws. In terms of colors, Les Mis tended toward a subdued, bluish palette. Amber tints also appeared – especially during the second half - and splashes of warmer hues popped up on occasion, but the end result remained low-key. That made sense for the story, and the image replicated the colors well. Blacks seemed deep and dark, while low-light shots delivered appropriate clarity. This was a consistently solid image. I also felt the DTS-HD MA 7.1 soundtrack of Les Mis suited the material. Music dominated the mix and filled the speakers well; vocals tended to stay centered, while instruments showed nice delineation and specification. Effects became a prominent element occasionally – such as during the opening or in the revolutionary sequences – but usually stayed in the background. The components kicked to life well when necessary and displayed good placement and movement. Audio quality was strong. Again, music remained the most significant component. Vocals – which acted as dialogue – appeared warm and distinctive, while instruments showed good heft and clarity. Effects demonstrated solid accuracy and vivacity, with nice low-end as necessary. The track worked for the movie and earned a “B”. We shift to extras and check out an audio commentary from director Tom Hooper. He offers a running, screen-specific take on the source material and its adaptation to the screen, locations and sets, cast and performances, story/character areas, various effects, cinematography and visual design, score and songs, and a few other areas. This marked the third time I’d listened to a Hooper commentary. 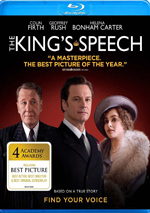 The first two – for Damned United and King’s Speech - worked well, and that trend continued for Les Mis. Hooper coves a good array of subjects and does so in a likable engaging fashion. He keeps us informed and entertained through this enjoyable commentary. 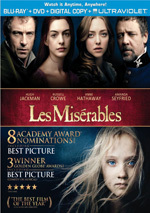 A collection of six featurettes called Les Miserables: A Revolutionary Approach fills a total of one hour, three minutes and 54 seconds. 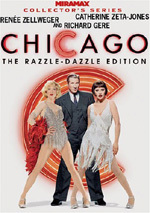 It includes notes from Hooper, producers Cameron Mackintosh, Eric Fellner and Debra Hayward, co-screenwriters/stage musical co-creators Claude-Michael Schonberg and Alain Boublil supervising location manager Camilla Stephenson, choreographer/musical staging Liam Steel, musical director Stephen Brooker, production designer Eve Stewart, 2nd 2nd assistant director Dan Channing Williams, Greenwich location manager Richard George, property manager Charles Lister, set decorator Anna Lynch-Robinson, property master Terry Wood, production sound mixer Simon Hayes, on-set pianist Jennifer White, supervising sound editor Gerald McCann, associate producer Thomas Schonberg, music producer Anne Dudley, key grip Alex Mott, vocal coach Roberta Duchak, and actors Hugh Jackman, Anne Hathaway, Russell Crowe, Amanda Seyfried, Eddie Redmayne, Samantha Barks, Colm Wilkinson, Caroline Sheen, Frances Ruffelle, Daniel Evans, Hadley Fraser, Joseph Peters, Paul Leonard, Matthew Corner, and Killian Donnelly. “Approach” looks at cast and performances, training and the choice to shoot live singing on camera, story and characters, sets and locations, shooting action scenes, and related topics. With more than an hour at its disposal, “Approach” should offer a detailed look at the production. However, it seems spottier than I’d like, mainly because it occasionally feels more like promotion than anything else; we get an awful lot of praise through these featurettes. Still, they do inform moderately well, and the shots from the set add value. “Approach” could’ve been better but it still deserves a viewing. For a look at the Victor Hugo novel, we go to the 11-minute, 11-second The Original Masterwork. It features remarks from Hooper, Mackintosh, Jackman, Hathaway, Boublil, UCLA French and Francophone Studies Professor Laure Murat, and Victor Hugo House Museum director Gerard Audinet. We get a look at Hugo’s life/career and specifics about Les Miserables. This becomes a quick but useful overview of the subject matter. The disc opens with ads for Schindler’s List, Anna Karenina, The Host. Smash, Jurassic Park, This Is 40 and the Les Mis soundtrack. No trailer for Les Mis appears here. A second disc provides a DVD copy of Les Mis. It includes the commentary and three of the Blu-ray’s seven featurettes. Even for a general non-fan of musicals like me, I find a lot to like in Les Miserables. It tells an interesting story in a positive manner and turns into an involving experience. The Blu-ray delivers excellent visuals as well as good audio and bonus materials. This turns into an all-around solid package.